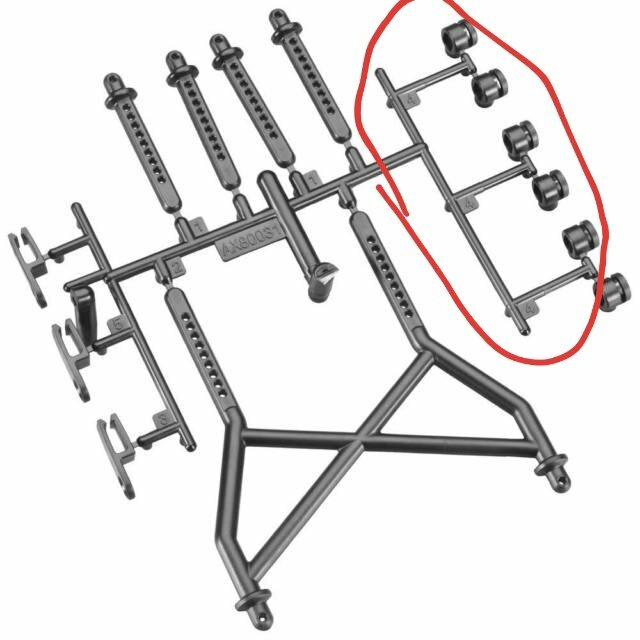 Maybe a stupid question, but how are these parts from the body post tree used? Not stupid at all, in my opinion. There's a whole video on the Axial site on weird stuff that comes lurking on trees. The RBK, for example, is made of components from like ten different rigs, and I don't know what half the crap I got is for. That said, I have had hours of fun finding uses for what was there but left over--washers, plastic nuts, servo savers, spacers, wire looms...For weeks, I didn't know what the green half-tennis-balls were meant to do. Post mounts for alternate style on mounting. I have used them to add posts to a plate chassis. Also to mount like pods to wraith chassis. There is a ton on odd stuff that I have no clue what they are intended for. Yeah, I have a big pile of mystical stuff like that from my Axial RTR leftovers..